COLOMBO, Sri Lanka, Feb. 06, 2018 (GLOBE NEWSWIRE) -- SLAppForge, a pioneer in facilitating serverless computing and application development over multiple cloud platforms, has announced its beta release of Sigma, a brand new cloud-based integrated development environment (IDE) for serverless computing and applications, with initial support for the AWS platform. Sigma intends to simplify and streamline the design, development and deployment of serverless applications, concealing the underlying platform-level complexities from developers, which has slowed down the widespread adoption of serverless computing. The Sigma IDE caters to modern systems and applications such as cloud, mobile and IoT, as well as for the disruption of traditional business and enterprise applications, utilizing serverless computing. Unlike typical cloud IDEs, Sigma operates completely within a standard web browser, eliminating the need to secure and maintain a server, virtual machine or container instance as a backend. Lightweight and fast, Sigma is compatible with all leading web browsers, and is itself a serverless platform, connecting directly from the web browser to the selected cloud service provider for all operations. All resources deployed by Sigma reside completely under the user’s own cloud platform account, and is subject to the same security, availability and scalability guarantees, at zero additional charges. With its intuitive drag-and-drop code composition, fully-automated resource and permission management, and reliable, hassle-free deployment capabilities, Sigma dramatically simplifies the process of composing serverless applications, for beginners and experts alike. Sigma currently supports application composition on Amazon Web Services (AWS) using Node.js, with future support for other cloud platforms such as Google Cloud Platform (GCP) and Microsoft Azure, and programming languages such as Java, C# and Go. SLAppForge has also showcased two fully-fledged applications demonstrating the use of their Sigma IDE for widely varying use cases. The first, SLAppBooks, is a cloud-based accounting application that runs completely on serverless infrastructure, and can be easily deployed on anyone's AWS account. The other, HotSpaces, is a location-based dating app that leverages serverless computing to help meet real people in real life, at popular meeting places. Several other sample use cases have also been published as ready-to-use serverless applications utilizing a variety of AWS services, including API Gateway, S3, DynamoDB, Kinesis and RDS. 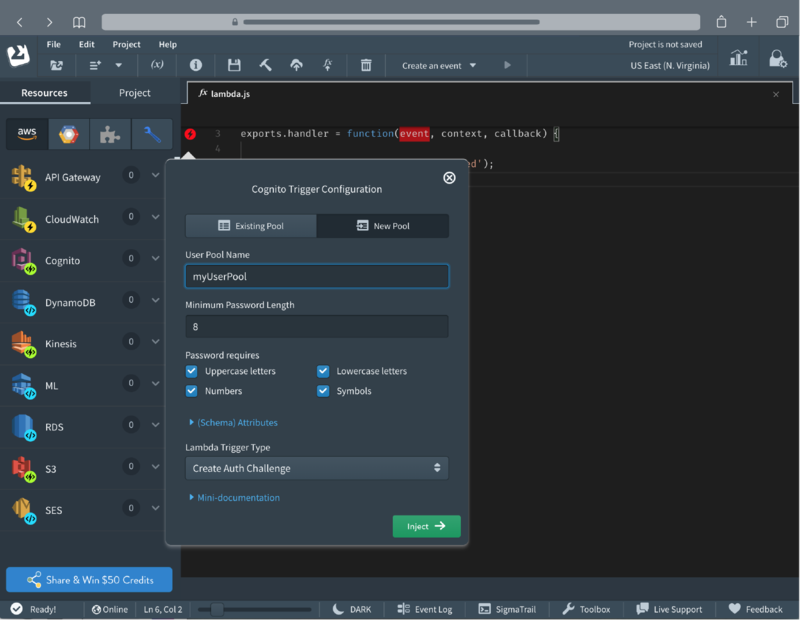 The beta release of the Sigma IDE is available free of charge, where users can simply sign up and start developing and deploying serverless applications on their own AWS accounts. SLAppForge Lanka Private Ltd. believes that serverless computing will disrupt the way that all applications are developed and deployed in the future. Its mission is to bring serverless computing into mainstream use for the business success of end users. Currently SLAppForge is looking for investment and technology partnerships that will help it achieve this mission. SLAppForge and Sigma are trademarks of SLAppForge Lanka Private Ltd. All other marks are those of their respective owners. Serverless Webhook? Deploy Yours in 5 Minutes – or Less! Serverless Stream Processing: Future of decision making? Serverless IDE for Google Cloud? Yes, now there is one! What makes a Storage Service Truly Serverless? Copyright © 2018 SLAppForge Lanka Pvt. Ltd. All rights reserved.